"This IS how you write a letter to God Janet." The Krankies enjoy their day off. "Boss, Boss, The Plane... The Plane"
"Ohh I love the pull a hanky from your nose trick, daddy." Hang gliding lessons for the under 5's. Like Ben Franklin, but instead of a key, Britney. "Daddy's got to pay alimony. So yes, this IS a stingray and we ARE at SeaWorld Orlando, honey." "Daddy made you a drone." A young Nicola Sturgeon named her kite Scotland, and watched it leave the UK, but she wasn’t tall enough to see it plunge into the North Sea. Dads have always refused to be sexist, Son, Daughter doesn’t matter they treat them all like boys. Dad it is clean, i did not wipe my nose on your hanky. Daddy's sending you to heaven. "Shouldn't you put that Skate back in the water now Daddy?" "Tony was a traditionalist and still communicated by semaphore." Daddy made a hat for his new imaginary friend. Tilly reckons he'll grow out of it soon. Man opens portal to another dimension! "But Daddy that drawing was for Mummy." "I'm worried about Jim, Mary. I think he may be on drugs. 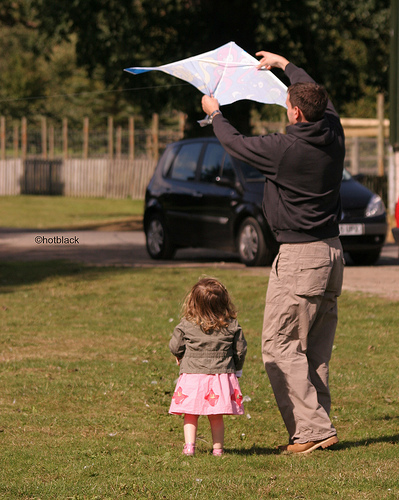 Our little Christine came home from the park and said that her daddy was as high as a kite." "There are just so many ways to re-use those old carrier bags and plastic straws Katie!" "Daddy, can we go to the cinema like all of my friends?" "Look Candice. See how it flies like a majestic eagle." "Oh Dad, you're just a soar loser."